There was outrage that the museum was hosting an event honoring the far-right president. 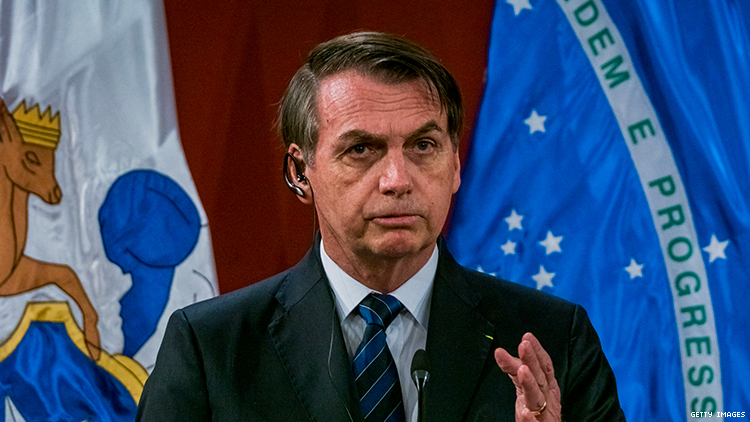 UPDATE (April 15th): After a week of public outcry, plans to honor Brazil’s far-right president with a gala at the American Museum of Natural History have been canceled. "With mutual respect for the work & goals of our individual organizations, we jointly agreed that the Museum is not the optimal location for the Brazilian-Am. Chamber of Commerce gala dinner. This traditional event will go forward at another location on the original date & time," the musuem tweeted out on Monday afternoon. The Brazilian-American Chamber of Commerce will honor homophobic Brazilian President Jair Bolsonaro as a “Person of the Year” at a banquet in New York City's American Museum of Natural History. Each year, the chamber honors two individuals — one American and one Brazilian — at a banquet at the popular museum. This year, the newly elected leader of Brazil will receive the honor, according to the Gothamist. An American recipient has not been announced. The event comes months after President Donald Trump met with Bolsonaro at the White House. The selection on Bolsonaro for such an honor by a business group based in the U.S. drew immediate criticism. Some told the Gothamist the museum shouldn’t allow the event, especially considering Bolsonaro’s record on mining and deforestation. "The fact that American Museum of Natural History would accept an event for something so counter to their own values, they should be ashamed themselves," said Priscila Neri, a Brazilian activist with WITNESS. Brazilian-American Chamber of Commerce officials declined to comment on criticism. But the event has already sold out thanks to members eager to possibly meet with the leader of a country where they hold business interests. Tickets cost $30,000 each.